Telegram is one of the best messengers out there. It works perfectly on all platforms and allows developers to create automation bots. In our case, we have decided to create a bot which will transmit quotes for selected instruments and parameters of selected portfolios (strategies) to users’ smartphones. At first, we thought about developing our own mobile application, but finally decided to create a bot, since it provides enough to cover all our needs. 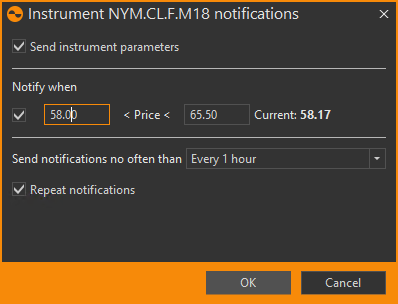 Give users the ability to receive notifications on their smartphones then and instrument set up price or strategy P&L breaks limits, as defined by the user. Below, what have we done. 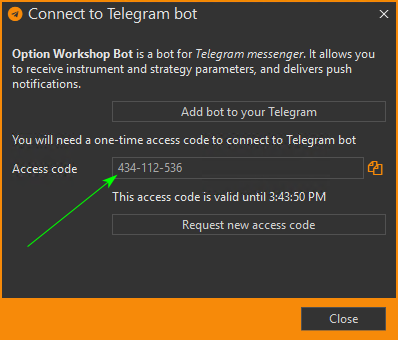 Then press the Add bot to your Telegram button; this will open a bot page in your browser. The browser will then ask for your confirmation to launch Telegram on your system and add the bot there. In Telegram, start a chat with the bot and then press the Start button. The bot will request an access code—enter the code you were given in the prior step. Now you are all set up. 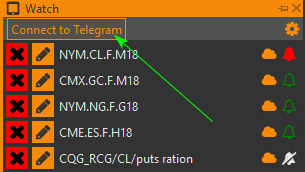 Now you can select instruments and strategies, which Option Workshop will then transmit to the Telegram bot. To add an instrument, select Add to watch menu item in the context menu of any instrument. The same goes for strategies. There are a couple images below demonstrating the process. For instruments, you can set up a price range at the exit from which, Option Workshop will send a notification to the bot. Big changes are coming in a part of software responsible for pricing. Until now, we would build an IV curve by just taking the midmarket IV (sum of bid and offer divided by two). That was working fine for actively traded options during actively traded hours. But outside the US trading session, when spreads are big or for strikes which are far from ATM strike, there could be no orders at all, this approach would fail. We can’t figure out an IV and as a result can’t calculate theoretical price and Greeks. 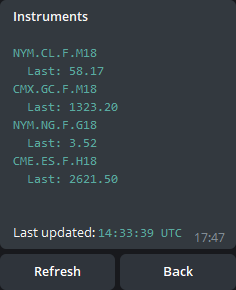 Added the ability to build polynomial approximation of current market IV curve on central strikes. Added the ability to shift IV curve with underlying instrument price move. User selects a basis – a number of central strikes at which midmarket IV’s will be used to fit the curve. Basis might be built symmetrically around ATM strike or shifted from ATM, either up or down. For strikes higher than ATM call options, IV will be taken; for lower strikes – puts IV. 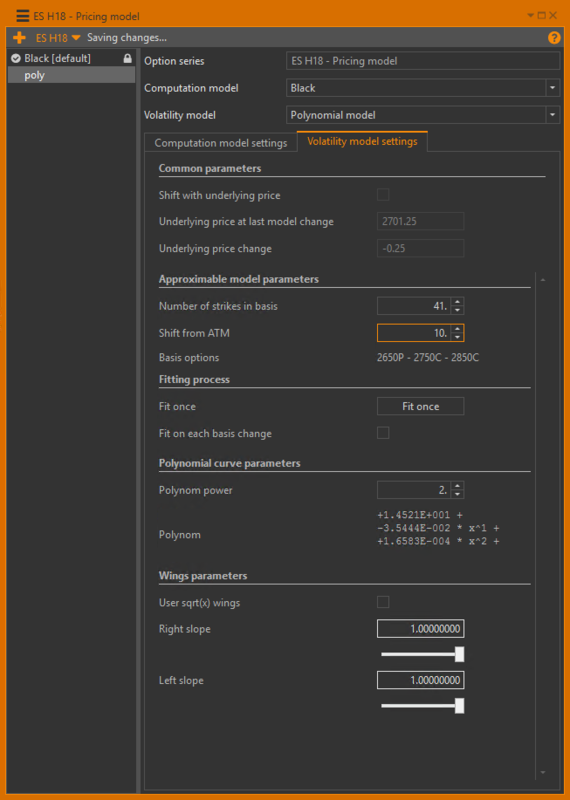 User can fit a polynom once or make program fit it each time basis changes. User can choose to make program use square root from X as a function, describing tails of the smile. 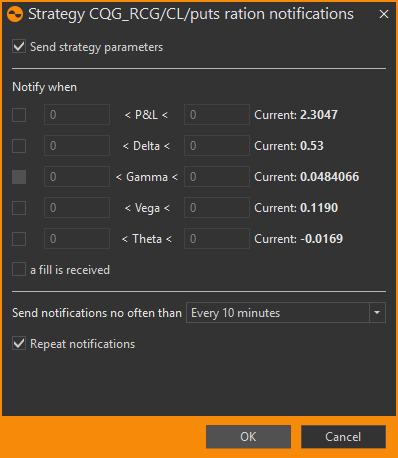 We have made some changes in our market-maker module aimed at minimizing the risk of operational errors and increasing the user’s speed and comfort when changing parameters. 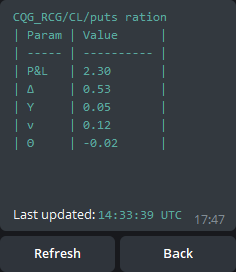 Now if you hold the Ctrl button while entering a spread value or number of contracts of some other parameter, this value will be applied to all the rows in a market maker. Also, the Alt+Enter combination now performs the Apply changes button feature. In rare conditions, market-maker module could place an order whose execution might lead to a position whose size breaks the limits set up by the user.